This dress is an endless stream of details from the neckline all the way down to the hemline. I love straps, but I wanted something softer and more demure for Beatrice. 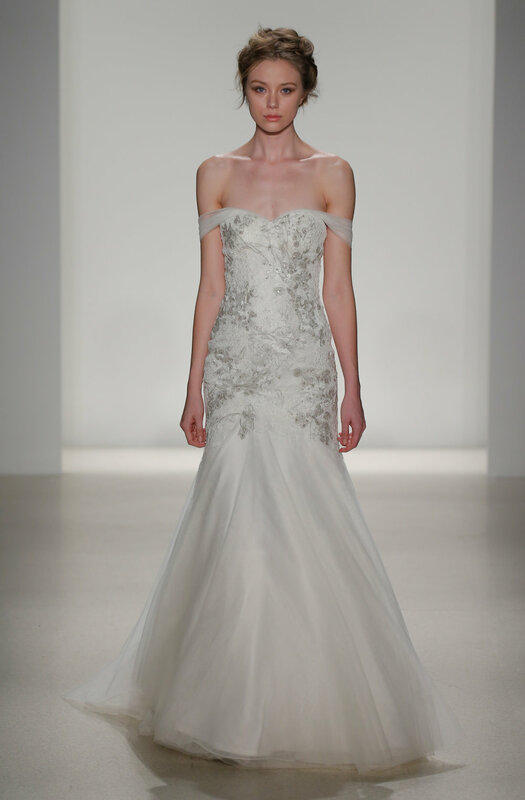 Drapey, tulle gracefully flow from the neckline, over the arm, and upon the back, giving a gentle hint of a sleeve. Make it your own-the sleeves can be pulled up and worn over the shoulders for a polished, new look. Beatrice’s soft, lush English tulle is delightful to the touch. The tulle is layered on the skirt to give it a rich, fit-to-flare feel while remaining light as a feather. You will thank us at the end of the evening when the dress is just as comfortable as when you first put it on. What makes Beatrice special? Her vintage metallic embroidery of intricate trickling leaves and vines. Think of Juliette’s balcony. Beatrice is for the bride not afraid to speak her mind or show her emotions. Texture is truly a key element of Beatrice. Starting with the corded Alençon lace layered with metallic embroidery, I added tiny two-cut silver beads to the embroidery outline. Aside from a tiny shimmer and sparkle, the beading is practically invisible and brings all the textural elements nicely together. Love it but do not want the shine? An all-ivory version of Beatrice is available without the metallic embroidery.